The blog posts have been slowing down. In part that’s because WE FINALLY GOT A GRILL! I know, I know, we’re like the last adult human beings on earth to acquire a grill. 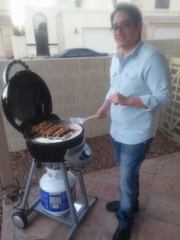 Here is a very blurry picture of my handsome husband grilling. This is why you should use real cameras, folks, instead of your smudged phone camera. So, since we are newbies when it comes to grilling, we have spent the last few weeks grilling a lot, but most of the stuff we have made has either been too simple to warrant a post, or has been pretty much an exact replica of somebody else’s recipe. Also, I’ve been working my usual research job, teaching, and returning to yoga (which is a really big deal since I’ve basically lived on the couch for the last year!) so I’ve been a little busier than usual. I’ll post some recipe reviews of our more successful grilling sessions later (including a post about those kebabs in the picture above), but today I will post my very first grill-involved personal invention. I’m really excited about this recipe, you guys. For one thing, it doesn’t require me to cook anything at all inside. That’s a big deal in the desert in the summer, when the last thing you want to do is turn on an oven inside the precious cool oasis of your house. 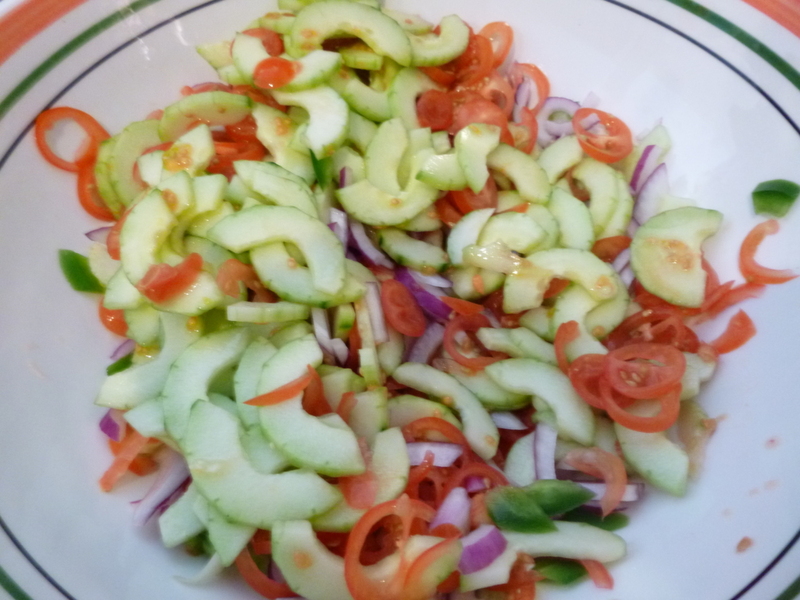 Secondly, it involves crunchy, fresh raw veggies that I actually seem to tolerate really well! And, of course, it tastes so good. The salad dressing is really light and just adds a hint of tangy-sweet flavor to the salad without overpowering the taste of the veggies. The inspiration for this dish was one of my husband’s summer favorites: http://allrecipes.com/recipe/mexican-shrimp-cocktail/. It’s really good, but I mean, every variation of the recipe includes stuff like clamato juice (hello, MSG and HFCS), ketchup, and even orange soda, so I wanted to find something that would be just as refreshing and flavorful but a little better for us. Here are the basics. 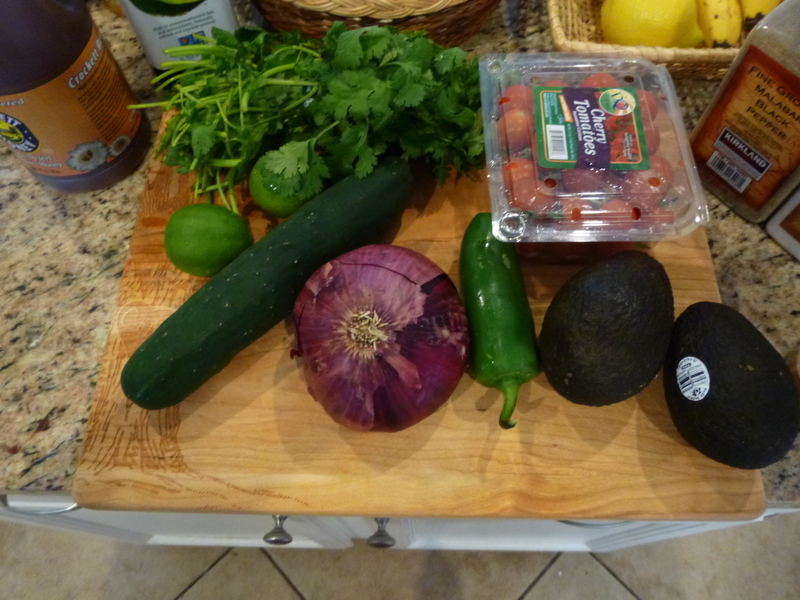 Not everything would fit on the cutting board, but you get the idea, right? 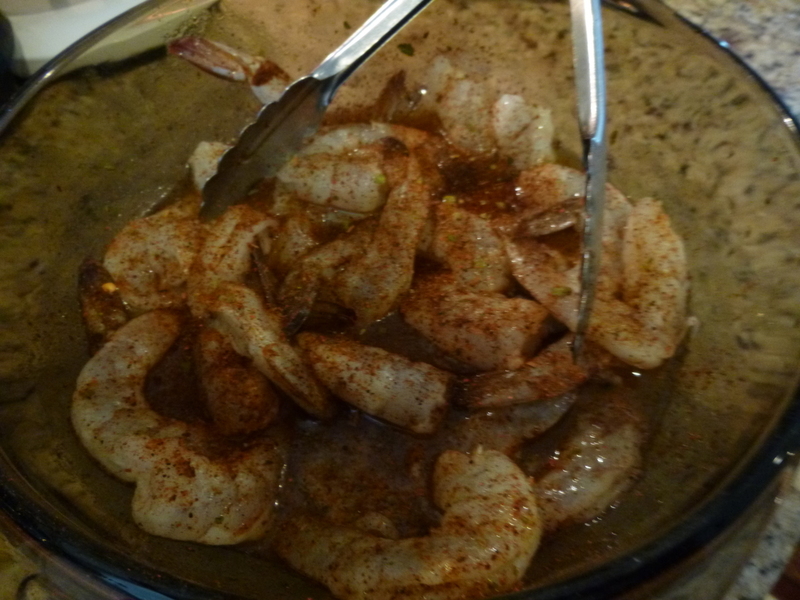 The shrimpies get a quick toss in the marinade/salad dressing. Then you chop up all the veggies. Finish off your salad dressing. Toss it with the veggies. And serve. Yum. It looks like a tropical vacation on a plate! *If you are planning on eating the whole salad right away, mix the avocados in with the rest of the veggies. Otherwise, chop up one just before eating and serve separately. First mix up your marinade/salad dressing by combining the lime juice, avocado oil, honey, cumin, sea salt, and black pepper. Reserve half and set aside for later. Pour the other half over your shrimp. If you are using the Arizona Dreaming seasoning, sprinkle generously over the shrimp (as in the picture) and toss the shrimp with the seasoning and marinade to coat. If you are skipping the seasoning, you may want to sprinkle a little paprika and cayenne on the shrimp for a bit of color and heat. Send your sweet husband outside with the shrimp. Grill over medium heat until curled, white, and opaque throughout. Meanwhile, toss all the chopped veggies except for the cilantro together in a bowl. I chop my veggies in the food processor so they are more uniform. 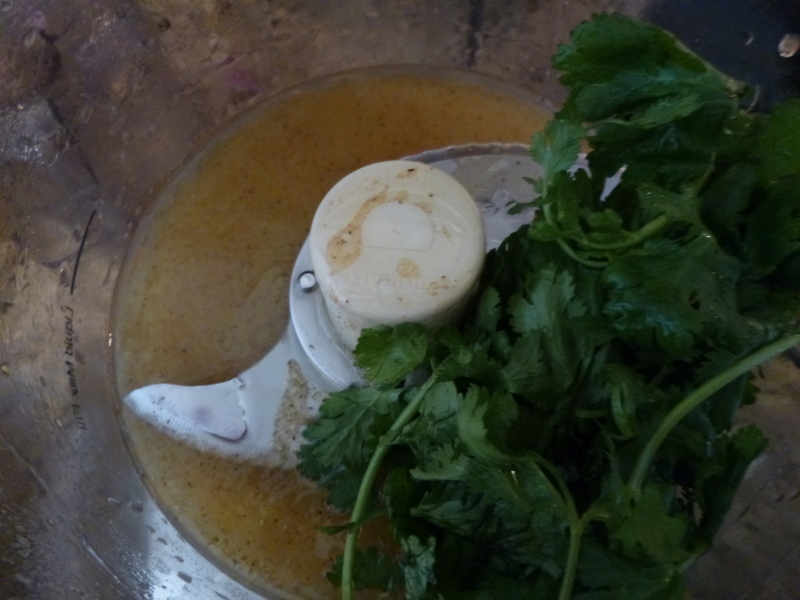 Place the reserved dressing in a food processor and add the cilantro. Pulse until the cilantro is finely chopped. 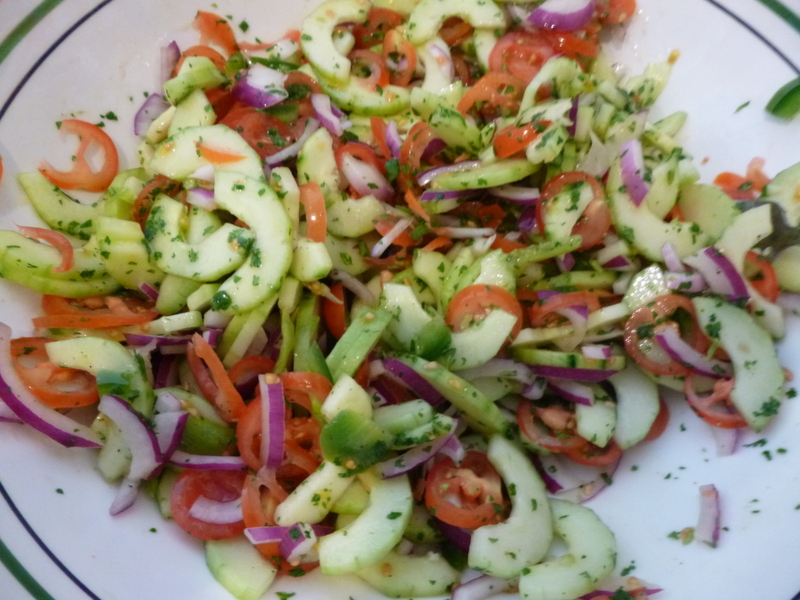 Toss salad dressing with veggies. Taste and adjust seasoning. That’s it. 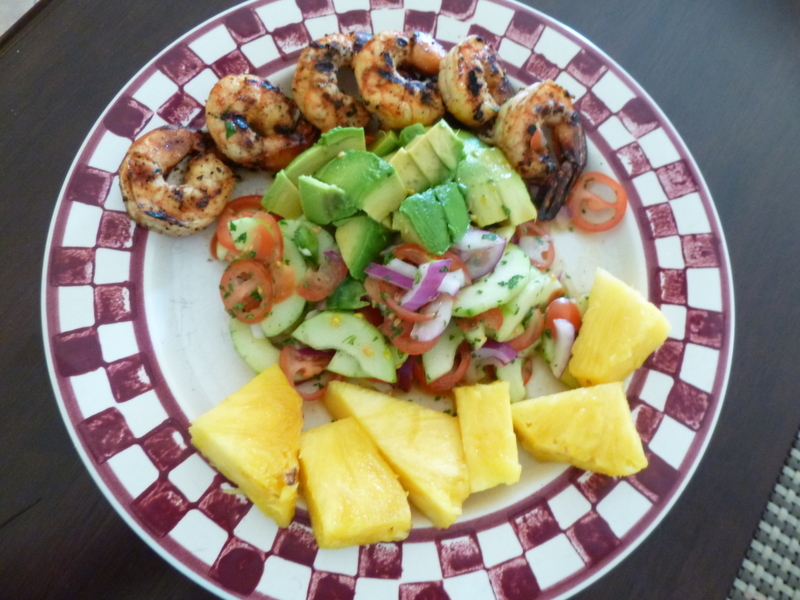 Serve with grilled shrimp and fresh fruit, if desired.